London, Day Two: It seems Londoners are so accustomed to the rain that more than half of them do not carry umbrellas. But, the rain boots are fabulous! All range of colors and styles from sparkly to camo and ankle high up to the knee. A bright spot on a rainy day. If we could have suspended time and crammed everything on our extensive list into one day, this would have been the day. After a drizzly start the sun made its appearance early in the afternoon and stayed out so we could play. And play we did. Our day began with breakfast and bad coffee at the hotel. We headed out down Piccadilly street toward the theatre district intent on getting cheap seats to something fun. Along the way we stumbled onto England’s answer to Times Square – Piccadilly Circus. Attractions lobbying for tourist dollars attempting to outshine each other were overshadowed by the giant tv screens the size of small countries. I couldn’t even tell you what was on them. One right turn later we entered an old theater lobby and scored some half price tickets to Spamalot. Note: this theatre will make another unplanned appearance later. We wound our way around through Trafalgar Square, following the direction the gentleman atop Nelson’s column was. I assume this was Nelson himself. His gaze pointed us toward Waterloo where we would find many of London’s treasures on our list. 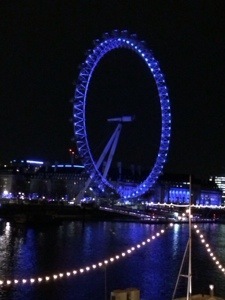 We finally made it to the Thames where we had a full view of the London Eye, the giant pod-carrying Ferris wheel. Impressive, but not enough to cross the river, we had other plans. We were headed to Somerset House for a little art culture. A few blocks down, along the river we found the “house.” Like White House sized house. The gallery we were seeking was small and completely over powered by the giant display being erected in the massive football field sized courtyard. Fashion week was coming to London In just a few days and much of it would be here. A roller skate ride through the gallery we saw the original works of many popular impressionists: Van Gogh, Manet, Monet, Renoir, Seurat, and Kandinsky just to name a few. Check. Onto the next. Having spied Big Ben earlier we headed back in his general direction. We took no less than 37 pictures of the silly clock tower, many of them from the same spot. Mistaking Parliament House for Westminster abbey we couldn’t figure out why there were so many guards keeping people out. Once corrected we meandered the grounds and headed back toward our hotel. We thought. Turning around, not for the first time today, we decided to find a coffee shop to rest and check our map. Assured we knew now where we were going we were unprepared for the tidal wave of workaday Londoners exiting and entering the tube. We were swept up in the momentum and whisked across streets and past landmarks at an amazing speed. When we were finally able to stop for breath we realized a turnabout was once again necessary. Weary with aching feet we trudged on. We came upon Buckingham Palace where a very kind guard confirmed our direction and gave us permission to walk through the dark park our concierge had warned us about. We had exactly 7 minutes to put our stuff in our room and catch a taxi to the theatre. No time for dinner. Lucky for us we had protein bars with us and the theatre kindly packaged the program with a bag of Cadbury chocolates. Great play, great fun. Back by 11 exhausted and ready to plan tomorrow.